Provides practical guidance on avoiding back strains and injuries in the workplace. 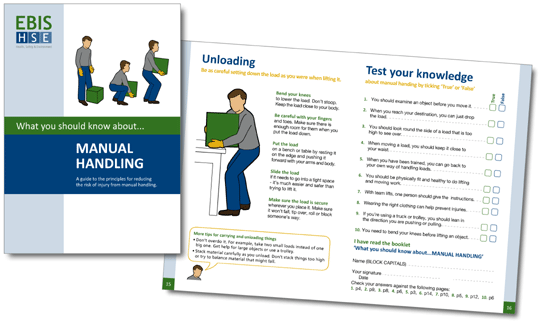 Includes advice on what causes strains and injuries, good posture, lifting and moving objects, looking after your back and what to do if you get back pain. What subjects are currently covered? If you have a requirement that is not listed please let us know as we are continually developing new subjects. Each manual has 16 or 24 pages, A5 size, in colour, clearly written and designed for ease of reading. The final page usually consists of a mini review to test understanding of the topic. Yes. We can add your organisations logo to the front cover and additional information on the back cover to be consistent with your corporate branding, subject to a minimum order quantity. Please contact us here is you have any questions.